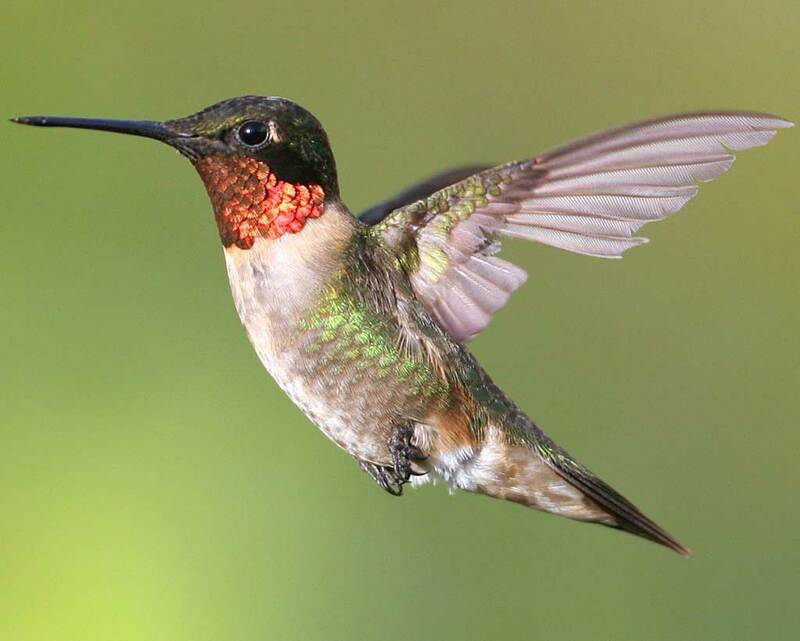 As we speak one of the most amazing events in nature is taking place: the spring migration of the Ruby-throated Hummingbird. Checking out the migration map the hummers have now reached southern Virginia, not far from the New Jersey border. This incredible and grueling journey of one of the tiniest birds in the world takes it clear across the Gulf of Mexico, a distance of approximately 1,300 kilometres (800 miles). It’s an almost implausible journey which is flown in one stretch, without stopping or even resting. Your backyard is an important stepping stone, a rest stop and sometimes a nesting place along the migration highway for these magical little creatures. Having the right plants in your garden to help them along may play a big part in their survival. Ruby-throated Hummingbirds feed on the nectar of tubular shaped flowers. Our native varieties of plants work best, getting their blooms at the right time and having the right nutritional value the hummers need to survive. Hummingbirds also feed on insects that may also be attracted to the flowers such as gnats, fruit flies, small bees, spiders and mosquitos. Here are my Top Five picks of native plants to introduce to your backyard that will help Hummingbirds thrive in your garden habitat this year. Cardinal Flower –Lobelia Cardinalis – Where there is Cardinal Flower there will be hummingbirds . Cardinal flower prefers rich, humusy, medium to wet soils in full sun to part shade. It will tolerate full sun in cool, northern climates, but otherwise appreciates a little shade. And don’t let Cardinal flower dry out for long if you want to have healthy and happy plants. Annise Hyssop –Agastache Foeniculum – The beautiful purple spiked flowers are not only great for hummers but are loved by butterflies and also by goldfinches when it goes to seed at the end of the season. Agastache is very adaptable and is easily grown in average, dry to medium moist, well-drained soils in full sun to part shade. It does well in moist soils but they can tolerate dry soils when established. Plants will self -seed in good growing conditions. Trumpet Honeysuckle –Lonciera Sempervirens – Unlike the invasive non-native Japanese honeysuckle, our native Trumpet Honeysuckle is a great addition the home garden. Its small, tubular red flowers are loved by hummingbirds and the red berries are cherished by many of our backyard birds. Our honeysuckle is best grown in average, medium, well-drained soil in full sun. It can tolerate shade, but it flowers much better with more sun. Trumpet Creeper – Campsis radicans – I almost did not add this to my top five list because it is such an aggressive, vigorous plant and at times not best for the backyard. But it is so great for the hummingbirds that I had to make it a top five selection. Trumpet Creeper is a woody vine which grows up to 30-feet-tall and is best known for its magnificent flowers. These bright orange blossoms grow up to three-inches-long and are craved by hummingbirds and even Orioles. Introducing native hummingbird plants to our backyard is a great way to help this wonderful and amazing little bird . Our backyards may become a last bastion for many migratory birds. Let’s all do our part to help them this year. If you have any questions on Hummingbirds drop me an e-mail at Greatauk4@gmail.com. Had as many as 5, and 1 or 2 Ruby Throats most of the fall season in our yard in Bayonne, NJ, after we put some cardinal plants in! Thanks Elise, yes, plant cardinal flower and they will come !